Scientists have found a compelling clue to what causes age-related memory problems, and to a way of one day differentiating whether those misplaced car keys are just a senior moment or an early warning of something worse. Wednesday's report offers evidence that age-related memory loss really is a distinct condition from pre-Alzheimer's -- and offers a hint that what we now consider the normal forgetfulness of old age might eventually be treatable. "You know not every band that comes from Liverpool becomes The Beatles," Dr. Scott Small, a professor of neurology at Columbia University Medical Center and a senior author of the study, told CBS News. "And most of our studies fail. So this is the one that worked." 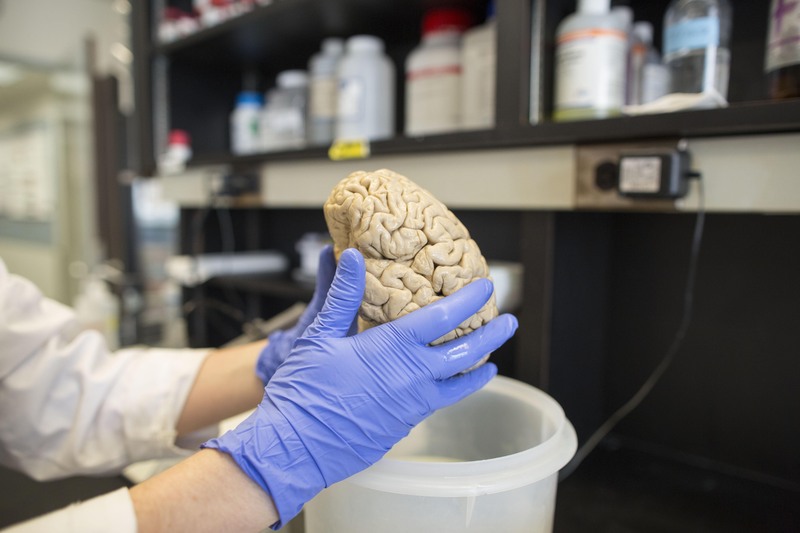 Small and other researchers at Columbia University Medical Center examined brains, young and old ones, donated from people who died without signs of neurologic disease. They discovered that a certain gene in a specific part of the hippocampus, the brain's memory center, quits working properly in older people. It produces less of a key protein called RbAp48. That section of the brain, called the dentate gyrus, has long been suspected of being especially vulnerable to aging. Importantly, it is a different neural neighborhood than where Alzheimer's begins to form. But the evidence that having less RbAp48 affects memory loss in older adults is circumstantial. So the researchers took a closer look at mice, which become forgetful as they age in much the same way that people do. Sure enough, cutting levels of the protein made healthy young rodents lose their way in mazes and perform worse on other memory tasks just like old mice naturally do. More intriguing, the memory loss was reversible: Boosting the protein made forgetful old mice as sharp as the youngsters again, the researchers reported in the journal Science Translational Medicine. "Can we take an old mouse and now increase the levels of this protein in that very small area of the brain affected by aging and show that we can make an old mouse look like a young mouse," Small, who is also director of the Alzheimer's Disease Research Center at Columbia asked. "And we did." The result was unexpected, Elias Pavlopoulos, an associate research scientist on the team, said in a statement. "It's the best evidence so far" that age-related memory loss isn't the same as early Alzheimer's, said Nobel laureate Dr. Eric Kandel, who led the Columbia University team. And since some people make it to 100 without showing much of a cognitive slowdown, the work begs another question: "Is that normal aging, or is it a deterioration that we're allowing to occur?" Kandel said. Added Small: "As we want to live longer and stay engaged in a cognitively complex world, I think even mild age-related memory decline is meaningful. It opens up a whole avenue of investigation to now try to identify interventions." This is early-stage research that will require years of additional work to confirm, cautioned Dr. Molly Wagster of the National Institute on Aging, who wasn't involved with the report. But Wagster said the findings add to a growing body of evidence suggesting "that we're not all on the road to Alzheimer's disease" after we pass a certain age. For example, other researchers have found that connections between neurons in other parts of the brain weaken with normal aging, making it harder but not impossible to retrieve memories. In contrast, Alzheimer's kills neurons. How do "super agers" have such good memories? How does Wednesday's research fit? Many pathways make up a smoothly functioning memory, and that protein plays a role in turning a short-term memory -- like where you left those car keys -- into a longer-term one, Kandel explained. Some good news: Scientists already know that exercise makes the dentate gyrus -- that age-targeted spot in the hippocampus -- function better, Small said. He's also studying if nutrition might make a difference. Scientists can now assess interventions whether diet, behavior, or drugs, he said. Said Kandel: "We have treatments in mice that work extremely well, and there's no reason why that wouldn't work in people -- if we work hard enough on it."